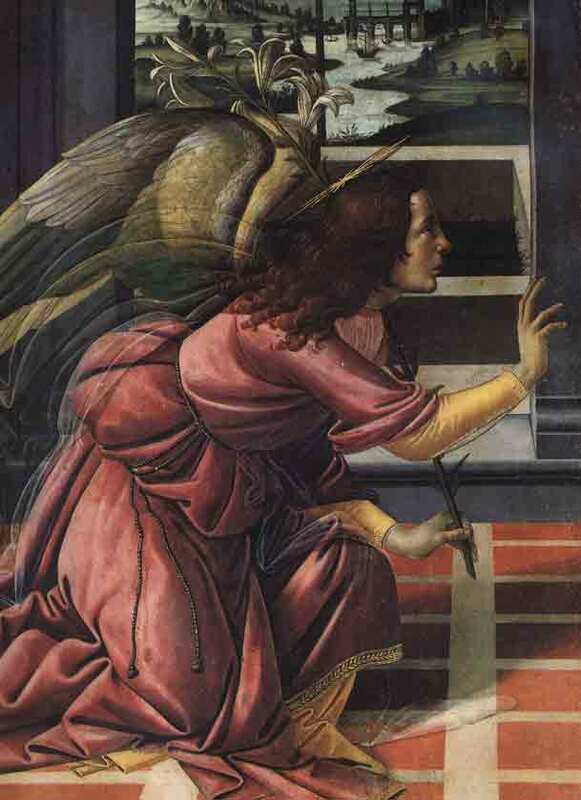 This small 4″ x 6″ egg tempera painting on panel is a reproduction of a detail of Boticelli’s Annunciation, which Boticelli painted in 1490 in egg tempera. The reproduced detail appears at the bottom right hand corner. Until the advent of oil painting, egg tempera painting on panel, as well as buon fresco, was the medium of choice for painters of the Renaissance such as Boticelli, Bellini, Domenico, Mantegna, Masaccio, etc. Egg tempera painting is normally done on small panels, the surface of which must be an ivory-smooth brillant white surface. To this end, the panels are prepared with up to five coats of traditional chalk ground gesso, made of up chalk, zinc white dry pigment and hide glue solution and sanded. Before painting, an ink underpainting is done on the prepared panel in a cross-hatch manner. The dry pigments to be used must first be finely ground with a mortar and water to make a pigment paste. Before painting, the quantity of pigment paste to be used for the day is mixed with a solution of egg yolk and water in a small palette. 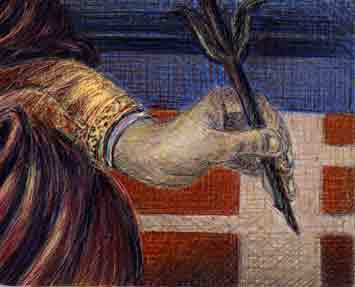 Traditionally, the colors are applied using numerous small brush strokes in a cross-hatching manner which is very evident in the above reproduction. Tempera paint dries very rapidly and the paint is applied in very thin coats, one over the other until the small brush strokes build up to the desired intensity and color. For those interested in the egg tempera technique, be sure to visit the website of the Society of Tempera Painters. Egg Tempera Fine Art also have an interesting web site in english and in french. Le site Egg Tempera Fine Art est également offert en français.